Dear diary, I met someone but he is a real blood sucker…..
Based on book series written by L.J. Smith, The Vampire Diaries is known for its big plot twists, turns, romantic subplots, and an abundance of largely supernatural elements including vampires, werewolves, hybrid vampire/werewolves, witches, warlocks, and so many more. Season 5 continues the love triangle between Elena (Nina Dobrev), Damon (Ian Somerhalder), and Stefan (Paul Wesley) while exploring a brand new setting in the college years, and a frightening new enemy – the doppelganger of Stefan. 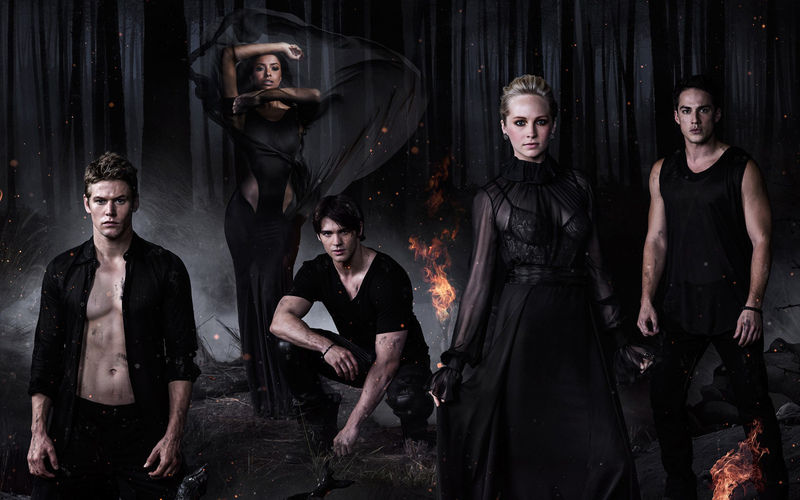 The Vampire Diaries is easily one of the most successful shows on WB’s CW network. The best example of the series writing veering away from quality writing is found in how many times the characters on this show manage to end up dead only to come back alive in some other form. Character’s that were once human could find themselves dying only to come back to life from a magic ring or are brought back as ghosts, or die and disappear only to be brought back by a spell later on. Meaning that you never know who you are going to see again or when. Then there’s the whole vampire and immortality thing: even there the writer’s find a way, with certain stakes that can kill vampires (but only certain ones), and stakes that can kill original vampires (but only as long as the stake is left in them for forever), so in other words a very, very long slumber from which the characters could be written back into the show at any time if the writers wanted to. Which makes you want to watch even more, to see if your favorite character that was killed will be back and as what. The writing does manage to keep things twisty and turny in a way that is compelling. This is a aspect of the show that keeps it easily entertaining and makes you want more. The new plot-line in Season 5 around the doppelganger of Stefan or is it the other way around?, or “shadow self” in the form of Silas certainly keeps things interesting. Silas is one of the more intense bad guys of the show and while Silas appears as if Stefan, as is performed by the same actor, the differences between characters is huge. The same can be said for the continuing story-line of the other double, the seemingly identical look-alike Katherine (who continues to look the same as Elena, but also is nothing like her). In Season 5, Katherine turns from a vampire to a human, as the sole recipient of the long-sought vampire cure, and things are complicated because of it. Seeing the way that actors Nina Dobrev and Paul Wesley handle these scenes is part of the fun, and it’s an amazingly proficient example of the benefits of quality film editing to see the scenes where characters have interactions with one another as played by the same actor. This is must add to your video collection. The new season premiers on CW on Thursday, October 28. Check your local listings for time and channel information. Save some blood (money) and order this DVD or Blue-Ray set now, including watch now with Amazon prime!